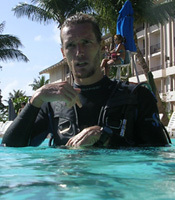 Dive Saipan,Saipan Diving,CNMI,Saipan,Tinian,Rota,Saipan Dive Sites,Tinian Dive Sites,Rota Dive Sites,Saipan Dive Shop Operators,Saipan Dive Boat Charter Companies,Scuba Instruction, Diving in Saipan, Northern Mariana Islands, Diving, SCUBA diving, Dive Tours. This 7 foot Tawny Nurse Shark (Nebrius ferrugineus) was hiding next to the rock at Eagle Ray City. 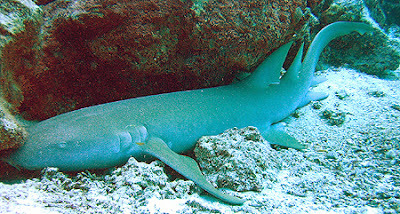 Nurse Sharks are docile and harmless, and spend most of their time resting on the bottom. It is most active at night and feeds on a variety of animals, including crustaceans, fishes, and sea urchins. They can grow to be 10 feet. THere are lots of these in the Florida Keys. They count negative against your score in shark fishing tournaments held there. When I grew up there we did not fish for sharks, we just watched them. Some tourists carried bang sticks but we locals just enjoyed having them around.